Mexican Fan palm trees (Washingtonia robusta) are native to Mexico, and are known for being a cold hardy palm tree as well as having a fast growth rate. These palm trees are popular in commercial and large residential settings. They add tropical appeal when planted along a long, winding driveway or wide walkway. Washington robusta (also known as Mexican Fan Palm and Washington Palm) belongs to the Arecaceae family, and can be planted year round in USDA hardiness zones 9 through 11. The Washington Palm tree is considered to be cold-hardy and drought tolerant - it will adapt to a variety of soil types and will thrive in partial to full sun. Washing Palms can grow up to eighty feet tall, with a spread of ten to fifteen feet wide. Star shaped fronds fan out from a straight, grey trunk to form a symmetrical crown or canopy. Lower fronds stay on the tree after they die, giving this palm a shaggy appearance. Star shaped palm fronds are green in color, with a leaf blade length of thirty-six inches. These palm trees are planted outdoors as single specimens in residential sized landscapes, or planted in a line along a long driveway or walkway. Mexican Fan palm trees add dramatic tropical appeal to residential and commercial landscape designs. Single specimens are typically used as a focal point in the landscape. Several trees can be planted in a row along a driveway or winding road in large residential and commercial landscapes. USDA Hardiness Zone– Can be planted year-round in zones 9 – 11. Location – Choose a location that receives partial to full sun. The location should be large enough to accommodate full growth. Washington palm trees should not be planted near structures or power lines. Allow a minimum of fifteen feet between plantings. Soil – Washington Palms like sandy, well-draining soil. When placing the root ball in the hole, make sure the tree is standing straight. Fill the hole halfway with soil and pack firmly. Fill the hole with the remaining soil while packing firmly around the base of the palm tree. Large, newly planted palm trees may need to be protected from winds and storms by using a brace. Water thoroughly after planting is completed. Newly planted palms like lots of water. For the first two to three weeks, water daily. Continue watering three times a week. Once established, palms require minimal watering. During the warmer months, approximately two to three times per week. Water approximately once a week during the winter. 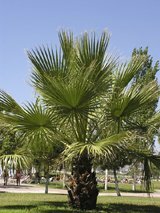 Approximately six weeks after planting, fertilize Washington Palms with a high-quality palm tree fertilizer. Fertilization schedule will be three times a year thereafter.